According to research polls, coffee is the second most traded commodity in the world next to water. This article will focus on some issues concerning brewing coffee and why it is highly important to use a plastic free coffee maker. 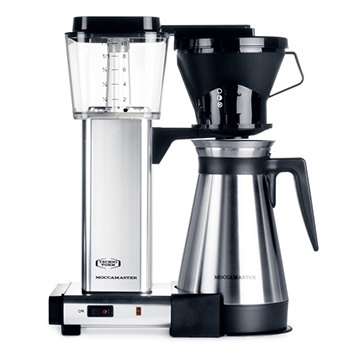 We will also focus on some of the most popular non plastic coffee makers in the market today. You do not have to compromise your health to have your daily caffeine fix, but we do need to ditch that plastic coffee maker that is infested with mold. Plastic free coffee makers are better options for you to use. When you use an all stainless steel coffee maker, there are no plastic components that get in contact with the water and your coffee at any point in the brewing process. There are plenty of these healthier kitchen appliances in the market, that include many styles and brewing capacities. Take a look at these reviews of plastic free coffee makers. Many of them make better cups of coffee and offer the advantage of not having to use a disposable filter. This coffee maker is all about speed. 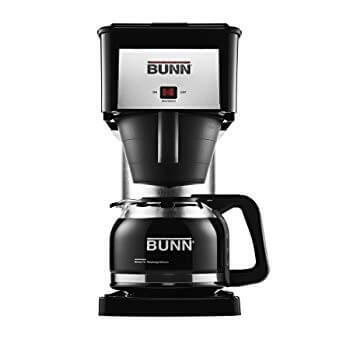 Most coffee machines take about 10-15 minutes to make 10 cups of coffee, but the Bunn BXB Velocity can do the same task in about three minutes. It has a built-in water heater so that the stainless steel water tank can remain hot and always ready to brew. Simply place cold water into the machine and after a few minutes, you will have your full pot of coffee. While the water remains hot, it is not boiling, which means you can still drink your coffee as soon as it is brewed. You may be wondering about its safety because it heats water all the time. It is perfectly safe and you can even sleep or leave the house without unplugging it. However, you should turn it off if you are going to be gone for several days. The water evaporates as it heats, so if you will not use it for a few days, the water level will get low. The drip-free glass carafe avoids messes when brewing your coffee. The porcelain-coater warming plate and glass carafe has a lighted on and off switch. It has a unique sprayhead to guarantee an even, perfect coffee flavor extraction. Regarding the taste, this coffee maker produces awesome coffee! 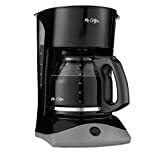 It's easy to use, it's fast and if you use it correctly this coffee maker will create tons of great cups of coffee for your daily enjoyment. Other than making coffee, the Bunn BXB Velocity has other uses. For example, you can heat water on it and use the water for your tea or hot chocolate. You can also use the hot water for cleaning and cooking. It makes coffee faster than standard coffee makers. You can barely notice a difference in your electricity bill when you use this coffee maker. It is perfect when you just need a bit of hot water because you can get as much water as you initially put in. Hard to empty the tank. Hard to clean and consumes more time cleaning than a standard coffee pot. Before using the Bunn BXB Velocity, read the manual first and carefully follow the instructions. Overall, it is a quality coffee maker. This machine is easy to use and can make a full pot of good coffee in three minutes. The Brazen Plus has a complex façade, so expect the first few times of using to be a bit on the difficult side. This machine has a learning curve, and we found it essential to read the instruction manual if you want any hopes of operating some of it's unique and awesome features. This coffee maker has a calibration program. It will boil a sample volume of water and at the same time, compare readings from the machine’s internal thermometer. The menu screens show the options for brewing temperature, so you have complete control on the temperature of the water source. You can also set a timer between 15 seconds and 4 minutes as the pre-soak time for the coffee grounds before the brewing process. If you add a little water to the coffee beans before brewing, the coffee will bloom and the process of extraction will begin. This coffee maker can brew a full pot in 6 minutes or less. It also has a manual release function, which means you can pour hot water into a different brewing container. Lots of ways to control the brewing process, such as pre-soak time, altitude, and water temperature. 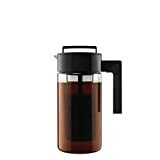 The thermal carafe provides optimal coffee temperature and makes the coffee stay hot for hours. It has a huge shower head and uses pulsed water flow to produce turbulence around the coffee grounds bed in order to saturate them completely. More coffee is needed to make smaller pots. The contents of the thermal carafe become cold quickly. If you are always changing your brews, the Brazen Plus has incomparable control. It also offers a smooth, balanced taste as it brings out the potential of the coffee beans. With its substantial use of metal, some glass, and clear plastic, the Technivorm Moccamaster is undeniably an attractive coffee maker. 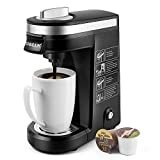 Regardless of its beauty, the important thing is the quality of brew the coffee maker creates and this particular machine does not disappoint. It consistently brews delicious pots of coffee. When you slide the carafe into its position, it properly presses a white button that performs as an added safety measure. Together with pressing the on/off button, pressing this white button will begin the brewing process. This prevents boiling water from flowing out of the machine in cases when the carafe is not properly placed. The water tank has a flat cover that is easy to remove and it also has a wide mouth so you can easily pour water into it. This is helpful when you still feel sleepy in the morning. The tank also has water markings that are clearly labeled (unit of cups and liters). Another great feature of this coffee maker is its modular and large removable parts that simply rest in place. Because of that, the machine is very easy to clean by hand. However, as a caution, do not wash its parts in a dishwasher, especially the thermal carafe. The whole brewing process takes about 6 minutes. It can also keep the brewed coffee hot for several hours. After some tests, the thermal carafe can keep its coffee at 150 degrees F for 6 hours. 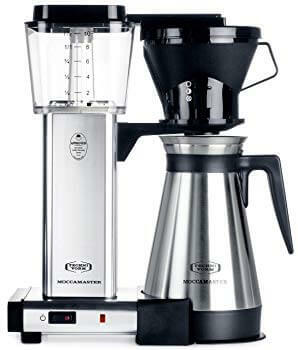 The Technivorm Moccamaster is expensive, but with its metallic good looks, compelling design, consistently tasty pots of coffee, and ability to keep the coffee hot for long hours, this coffee maker is well worth its price. Enjoy your cup of Joe without the health risks of harmful chemicals. These no plastic coffee makers will allow you to brew your favorite drink just as conveniently as plastic coffee makers. The safety factor more than makes up for the higher price tag too. 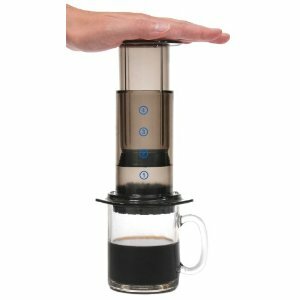 Aeropress offers a unique brewing process. This machine allows you to control the strength of your coffee! If you want it strong, you can use the regular method by making your coffee concentrated and adding water. If you want it stronger, you can add less water. The other method – inverted method – is by steeping the coffee, adding the filter, flipping it over, and plunging. The regular method takes about one minute and the inverted method about two minutes, but this will be up to you. Both methods make great tasting coffee, but there is not much difference to justify the extra time needed for the inverted method. However, if you love the aroma, you will surely like making your coffee using the inverted process. Aside from making tasty coffee quickly, there are other benefits that the Aeropress coffee maker offers (Source). It uses paper filters to filter out kahweol and cafestol, which are substances in coffee that are believed to be a health risk when drinking coffee. Studies state that those who drink unfiltered coffee can have increased bad cholesterol compared to people who consume filtered coffee. This coffee maker does not require electricity and is really portable. You can take it with you camping or on a vacation. As long as you have coffee beans or ground coffee, source of water, and can heat water in some way, you can have a good cup of coffee wherever you go. The espresso it makes is not quite espresso as there is something missing, possibly the effect of high pressure extraction that other espresso machine has. 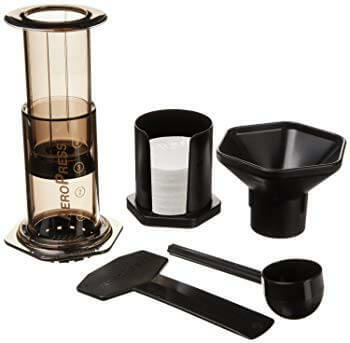 If you are a coffee lover, you should have the Aeropress Coffee Maker. For its low price, you can make great coffee with it. 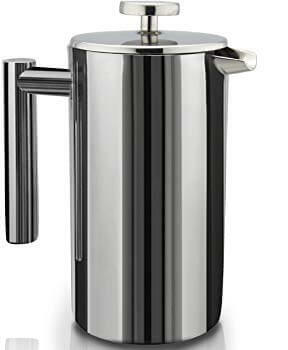 The SterlingPro French Coffee Press is made of stainless steel. Its exterior mirror finish makes it look refined and beautiful. While this coffee maker is heavy, it looks well-made and feels sturdy. The stainless steel construction makes it really easy to clean, but the mirror finish tends to easily collect fingerprints. At first, you might think that the dual filters will make the plunger of this French press harder to push down, but it will not. There is only a little more resistance compared to a single filter French press. With regard to the taste, it creates fantastic tasting coffee and you will not see any coffee grounds. Because of the double walls, it works better than single walled French presses when it comes to keeping the coffee warm. The coffee can remain warm for up to three hours. The mirror finish collects fingerprints easily. The SterlingPro French Coffee Press is well-made. It makes great cups of coffee and can keep the coffee warmer longer than the usual single walled coffee press. Percolators make the best cups of coffee that is full of flavor. 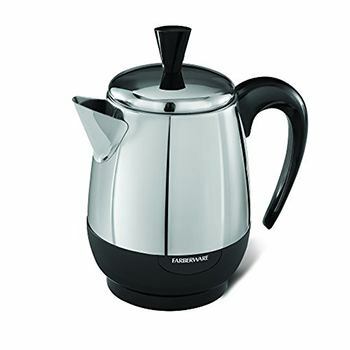 The Farberware Percolator is one of the best percolator machines in the market as it can make rich, aromatic coffee. The machine is constructed with a stainless steel basket that holds the coffee grounds and also works as a filter. The bottom of the basket has holes that allow the brew through. This assures that your coffee will consistently have high-quality taste. This is different from other coffee makers that need to use paper filters that may change the taste of the coffee. Because it is made from stainless steel, this guarantees that the brewing process will not affect the taste of the finished coffee in any way. 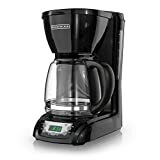 This unit is electrically powered, so it eliminates the high-maintenance brewing process that is usually linked to stovetop percolators, such as careful monitoring. The Farberware percolator is made with high-tech components that make the brewing process very simple. It has an auto shut-off feature that turns off the machine right after the brewing process. Then, it also has a keep warm feature that switches on once the shut-off feature is activated. The unit also minimizes the risk of scalding because its handle is heat-resistant. 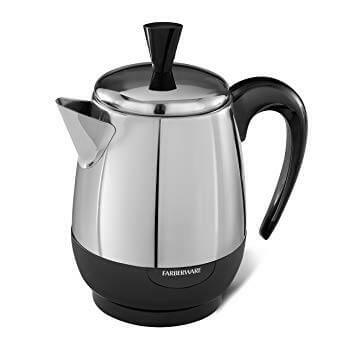 Farberware Percolator will be worth your money, and thus, highly recommended, especially for a household with few family members or those who do not entertain lots of visitors. Pesticide exposure – Coffee is an extremely sprayed crop. Caffeine dependence – If you rely on caffeine too much as a stimulant, it can have negative effects on the adrenals (Source). 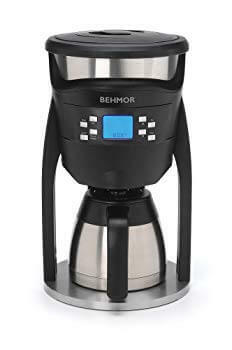 Mold – Substandard sources of coffee, such as low-grade coffee makers, can harbor mold. A boost of healthy fats can improve the benefits of coffee. To protect the natural cortisol patterns of the body, drink coffee between 9:30 and 11:30 in the morning. To get the most out of the benefits of coffee, choose a healthy coffee maker without burdening the environment or adding harmful chemicals. Getting Rid of the Pods - The popular k-cups or coffee pods have become a problem for the environment. Billions of them have been reported to be piling up in landfills every year. Plastic chemicals from these pods can leech into your coffee and affect your health. It is also worthy of noting that the machines themselves, whether using coffee pods or regular coffee filters, are often made of plastics. When the hot liquid passes through their plastic parts, chemicals can leak into your brew as well. Mold in Your Coffee - The warm, dark, and wet environment of many coffee makers offers the ideal location for mold, mildew, and biofilms to grow. Some tests have been conducted and about half of coffee cups tested had mold spores, possibly from the tubes inside coffee makers. Unfortunately, the acidit​​​​​y of coffee and hot water cannot kill mold. When you use a French Press, you can control the temperature and intensity of your coffee. While this coffee maker does not require any heat or electricity, you should preheat the water using a different method. It does not keep coffee warm, but it is an excellent choice for making cups of quality coffee. You can also use it to make tea. 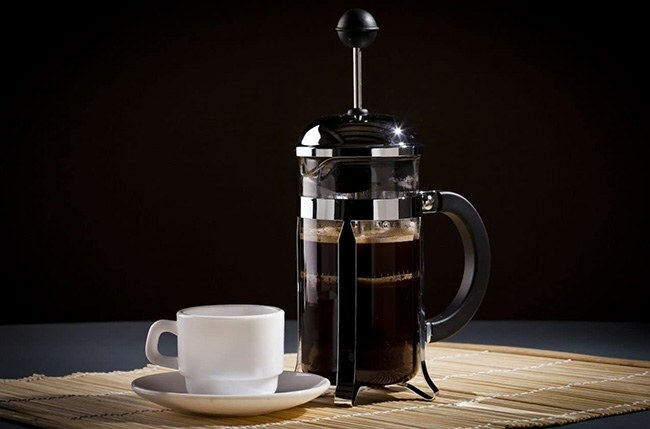 Conventional French Press machines are usually made of glass with an interior filter made of stainless steel. However, there are now French Press coffee makers that are completely made from stainless steel. They will not break or crack like a number of the glass machines. This does not require a filter or additional equipment. You can simply plug it in and it is easy to clean as well. 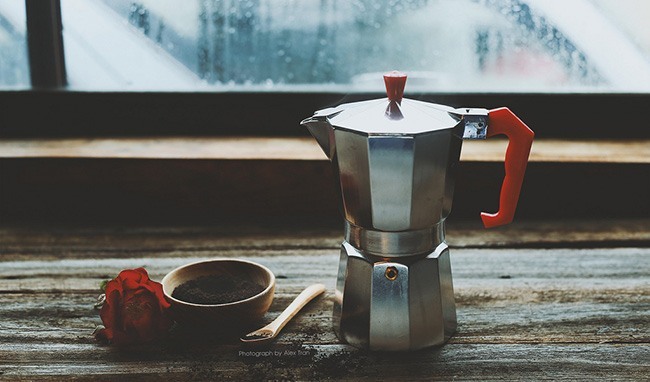 Like a coffee pot, a percolator also keeps coffee warm, which makes it a good choice for those who want to have a cup of warm coffee for a few minutes longer. To avoid plastic and for durability, you should choose a completely stainless steel percolator. Instead of steel, some espresso makers are made from aluminum. They are harder to find, but stainless steel espresso makers do not lead to the health risks of aluminum and they work just as well. 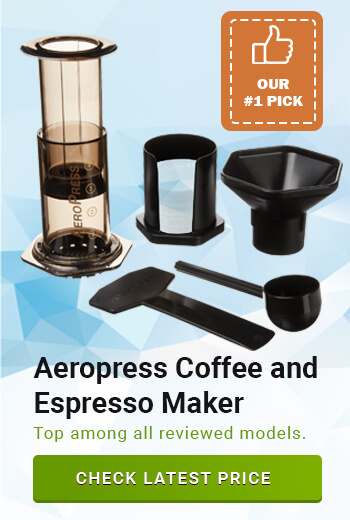 These machines are a good alternative for people who like espresso better than regular coffee. Using a plastic free coffee maker is no doubt the best option to brewing your coffee. Investing in such a kitchen appliance is well worth every penny. Whether you want a single-cup on-the-go coffee maker or one that can brew coffee for you and your staff during your office all-nighters, you have plenty of brands and models to choose from. If you are still using a coffee maker that has plastic components, it’s time to ditch it and head on out to get a non plastic coffee maker. It’s healthier for you and for the environment as well. 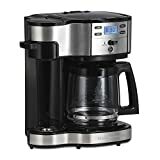 What is the Best 4 cup Coffee Maker?